In an interesting article that I found online it discusses how Ohio is the number 2 state in the US for producing the most carbon pollution from their power plants. 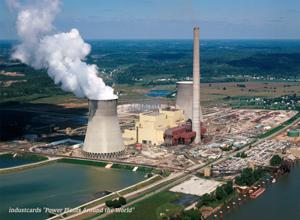 The article touches on how Ohio has 6 power plants ranked in the top 100 carbon polluters in the country including: General James M Gavin at 7th, JM Stuart at 25th, and FirstEnergy W H Sammis 39th. Another interesting fact that is stated in the article is that Ohio’s power plants alone produce as much carbon each year as 25,200,000 cars. There have been attempts from various local environmental Ohio groups to get Senator Brown to step up and deal with the problem at hand. However, Senator Brown has not yet made any statements or attempts at looking at the issue thus far. This summer, President Obama directed the EPA to propose limits on carbon pollution from new and existing power plants in the US. What I found most important about Eating on the Wild Side was the fact that rather than a treatise on the information that our crops have lost nutrients through selective breeding, it is a practical guide to finding those that are most healthy for you. The author selected the information from scientific journals and created a go-to system for a healthier lifestyle. In our striving for living a more sustainable and ecologically informed lifestyle we often focus on the possession of simple facts as the goal of environmentalism. Yet the more time goes on the more we realize that simply knowing how we are living in and affecting out environment is not enough. We need to develop methods and lifestyle changes that allow us to act on our knowledge without requiring us to be economically or educationally privileged. The second half of Eating on the Wild Side covers the sweeter plant group, fruits. It continues the practical approach we have seen in the earlier part of the book, the fact that we should eat cherries rather than store them for instance. There is less detailed history on as many of the plants in this portion due to the fact that it seems less research has been done, but the core of the book was never exactly this information. This article was interesting because I had never thought of something like my wallet as even possibly detrimental to the environment. For our reading of Eating on the Wild Side, I wanted to do something that I may actually do in the future, instead of just choosing a recipe from the book and doing it just to do it. I frequently make/ order smoothies, but generally they contain ice cream. I don’t think it’s wrong to indulge in some ice cream, but it obviously would be healthier without it. I paired up with Jake Eldridge and made a smoothie with organic bananas, peaches, grapes, apples, and orange juice. No added sugar, no ice cream, just organic fruit. I’m happy to say we were successful in making a delicious smoothie without the ice cream I would normally use. Historical Status of land surrounding? National Laws – Clean Water Act etc. County/City – plans, regulations etc. Darwin’s finches are a group of birds composed of fourteen different species, in which all but one are found on the Galapagos. They are iconic to researchers for their classic display of evolution. These birds have been studied for a long time, and we have record of the changes and divergences of their species traits. Unfortunately, two of these treasured species, the mangrove finch and the medium tree finch, are now listed by the International Union for Conservation of Nature (IUCN) as critically endangered. Many other populations are facing decline. The major reason for their decline is a parasitic fly called Philornis downsi. The fly is typically found in Trinidad , Brazil, and is predicted to be found in other countries of South America. It was introduced to the Galapagos Islands in the 1960s, but it was not worried about until the 1990’s were they have been a problem ever since. It is the larvae of Philornis downsi that are the cause for the concern. The harmless adult female fly will lay her eggs in the nests just as chicks are beginning to hatch. The fly eggs will hatch, and the larvae will crawl into the nasal cavities of the chicks where they will eat away at nasal cavity. Three days later, the larvae will move to the bottom of the nest and hide during the day. They wait until nighttime to feed on the hatchling’s blood. Nests infested with the parasite often do not live (between 60-100 larvae can be found in a nest alone). Those that do are deformed and have a tough time eating due to deformities of the beak. It is particularly devastating, because Darwin’s finches depend on the beak variation to survive in the habitats. Their beaks are formed to specialize in specific niches in their unique habitats. The fate of the birds currently does not look good. Some of the species have become extinct locally on at least one island they previously inhabited. The warbler finch seems to have vanished from the island of Florena. The mangrove finch originally inhabited the islands of Fernandia and Isabela is now only found on a small portion of Isabela. Their population is estimated to be around eighty individuals. The current outlook for the species is not helped due to the fact that only twenty chick hatched this breeding season. Nearly a third of the chicks did not survive. Philornis downsi parasitism has been blamed for their deaths. Researchers are calling for a need to control the fly’s spread. The parasite attacks finch fledgling reducing the mortality rate of the population. The birds do face other factors including habitat degradation, disease, and predation from other introduced species. The specific threat of the parasite seems to have a determining factor. Being that no bird species has gone extinct from the Galapagos Islands since humans reached the them in the mid-sixteenth century, the loss of these birds out be a blow to the fragile ecosystem of famous place. Click picture for more information about the Medium Tree Finch (Camarhynchus pauper). Plans and proposals exist, but each have their own problems and rewards. First, Scientists from the Charles Darwin Foundation, San Diego Zoo, and the Galapagos National Park Directorate are planning to remove mangrove finch chicks from the island in early 2014 to try to raise the chicks in incubators. (Other project: IUNC Mangrove Finch efforts) Also, last year, a workshop was held on the Santa Cruz Island to develop methods to control the fly, but funding and difficulties with trying to raise the fly in captivity have halted efforts. Proposals for biocontrol with a parasitic wasp and using chemicals, but there are too many questions about long term effects. A final proposal is to let nature takes its course and evolution to act. Adult finches have been recorded eating the larvae, therefore reducing the numbers of parasites in their nest. I’m going to put both weeks of Eating on the Wild Side into one blog post this time. For the cooking part, I have made the Grape, Mint, and Feta salad that is on page 312 of the book. I’m not sure if we have anyone in the class with any nut allergies, but I went ahead and took the precaution anyway and excluded the nuts from the recipe. The grapes that I obtained from the Community Market are Scarlet Royals, which I looked up in the book and could only find information about Autumn Royals. Regardless, they are a subset of the Royal grape family, which is up at the top of the list of recommended varieties of grapes. While I was reading the section on grapes I realized that picking out grapes is just like picking out any other type of fruit: you should look for signs that they are fresh. I had never given much thought to this, but according to the book, you should find grapes that are attached to green vines rather than brown ones. Also, when you shake the vine, all of the grapes should stay on the vine and there shouldn’t be very many hanging out at the bottom of the bag. On another note, the section about kale I found to be pretty interesting. I’ve heard of kale and how supposedly good it is for you, but I had never given it much thought on what it was or why people don’t seem to eat a lot of it. This is a puzzling fact, because kale is a good source of cancer-fighting, heart protecting glucosinolates as well as it being high in vitamin C, K, A, fiber, manganese, copper, calcium, tryptophan, potassium, iron, protein, antioxidants and many more vital nutrients that our bodies need in order to be healthy. I thought that the recipe that the book gives for kale chips sounds really good, and I might have to try it sometime. For class I will be whipping up some smoothies made up of berries from the Farmers Market down the street. Berries ie. Blueberries and blackberries have been known to help with preventing cardiovascular disease and fighting cancer. Possible the biggest shock while reading was the study that found out by eating berries one can slow brain aging. I have seen what Alzheimers does to people and it was interesting to find out that small berries can help slow down such a tragic processes. You are currently browsing the Environmental Geography blog archives for September, 2013.